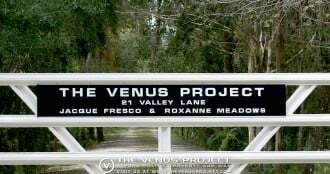 The Venus Project is an organization that is founded on the ideas, designs, and direction presented here. It represents many years of research and dedication on the part of its originator and Project Director, Jacque Fresco. Its 25-acre research and design center is located in Venus, Florida where the future is taking shape today. The function of The Venus Project is to design, develop, and prepare plans for the construction of an experimental city based on the -principles outlined above. Here we have constructed nine experimental buildings, are developing alternative energy systems, city designs, transportation, manufacturing systems, and more. In support of this research we are creating blueprints, renderings, and models, holding seminars, producing books, videos, and other written material to introduce people to the aims of The Venus Project. The Venus Project is in the process of introducing a set of values and procedures that may enable us to achieve social transformation. The Venus Project will provide the designs and blueprints for a prototype community to test the validity of its social proposals and to establish a permanent planning center that could be used for future short-term and long-term project planning. It also proposes a relevant orientation for people to be able to adapt intellectually and emotionally to our new technological age. Anything short of overall social design would be inappropriate and far less effective. Our proposals will be submitted to the general public and all educational institutions, and we invite their participation. If enough people find the proposals acceptable and choose to join with us in this new advocacy, this could help to form the nucleus of an organization to further the aims of The Venus Project. Conserving all the world’s resources as the common heritage of all of the Earth’s people. Ultimately utilizing the highest quality products for the benefit of all the world’s people. Assisting in stabilizing the world’s population through education and voluntary birth-control to conform to the carrying capacity of the earth. Enhancing communication in the new schools so that our language and education is relevant to the physical conditions of the world around us. Like all other innovative social proposals, it starts out with a few devoted people that dedicate their time to informing others of the humane benefits of this new direction. People are invited to participate in whatever capacity they can to help carry out the initial design phases of this new experimental city. An interdisciplinary team of systems engineers, computer programmers, architects, city planners, sociologists, psychologists, educators and the like would also be needed. The design of The Venus Project does not regard environmental conditions as fixed or static. We must allow for adaptation and change within the system as a continuous process. This would avoid the tendency to perpetuate temporary arrangements beyond their period of usefulness. The circular city proposed by The Venus Project would be a transitional phase and could evolve from a semi-cooperative money-oriented society to a full resource-based economy. This could be the prototype for a series of new cities to be constructed in various places throughout the world. The rate of progression will depend upon the availability of funds raised during the early stages and the people who identify, participate, and support the aims and direction of The Venus Project. As these new communities develop and become more widely accepted, they may very well form the basis of a new civilization, preferably through the process of evolution rather than revolution. We are well aware that no one can actually foretell the shape of the future. We can only extrapolate on present information and trends. Population growth, technological change, worldwide environmental conditions, and available resources are the primary criteria for future projections. We are also aware that there is no single philosophy or point of view — religious, political, scientific, or ideological — that someone would not take issue with. We feel certain, however, that the only aspects of The Venus Project that may appear threatening are those that others project into it. The Venus Project is neither Utopian, nor Orwellian, nor does it reflect the dreams of impractical idealists. Instead, it presents attainable goals requiring only the intelligent application of what we already know. The only limitations are those we impose upon ourselves. The Venus Project does not advocate dissolving the existing free-enterprise system. We believe it will eventually evolve towards a resource-based society of common heritage in due course. All that The Venus Project offers is an alternative approach for your consideration. It is not possible in this short writing to present the precise methodology and operation of a global resource-based economy. We encourage you to become better informed about the proposals of this project through our books, videos, lectures and seminars. If you identify with this direction, we welcome you to join with us and work towards its realization.